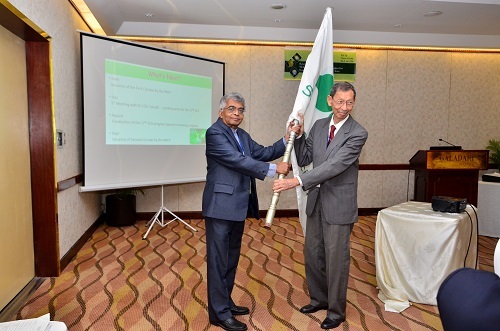 The 16th SCA Conference included an International Symposium consisting of an Inauguration Ceremony, 4 Plenary Sessions (9 Keynote Speeches), Dialogue with Prime Minister of Sri Lanka, Four Parallel Session, each with 4 to 7 oral presentations, a poster session with 12 posters and a Closing Ceremony), SCA’s Management Board Meeting I and II, General Assembly I and II, and Joint Program Workshops (JPWS). The Conference was attended by around 20 countries/region with approximately 150 participants. At SCA General Assemblies and Management Board Meetings convened during the three-day Conference, the 16th SCA Declaration and “Future Strategic Plan” was approved after a discussion. Furthermore, the host countries of China for 2020 Conference and Korea for 2022 Conference were approved. 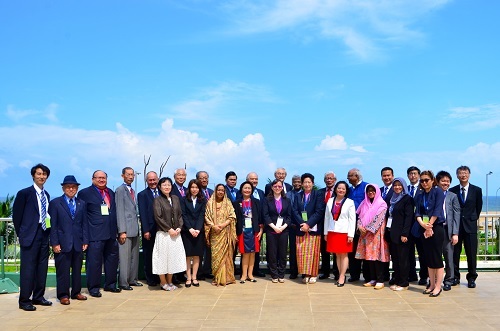 We, the participants of the 16th Science Council of Asia (SCA) Conference in Colombo, Sri Lanka, have had intensive discussions on the theme of “Science for the People: Mobilising Modern Technologies for Sustainable Development in Asia,” in keeping with the declared objectives of SCA. The role of Science and Technology in sustainable development of society should not be underestimated. However, in order to make this a reality, the potential of Science and Technology must be fully realised by strengthening inter-disciplinary cooperation. This can be achieved taking into account regional diversity with the collaboration of all the countries in the region. SCA has worked to strengthen cooperation between scientists and facilitate discussions with policymakers in its role of being a multi-functional platform of networking for science organisations in the region. 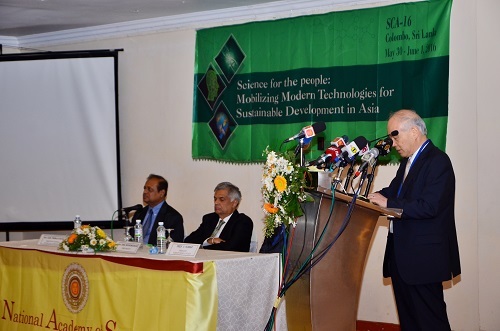 Approximately 150 scientists from around 20 countries/regions who participated in this year’s SCA Conference discussed how state-of-the-art Science and Technology could be best utilised for Asia’s sustainable development. SCA will strongly facilitate bilateral and multilateral joint research in the region. In order to achieve sustainable development in Asia utilising modern Science and Technology, scientists in the region, who belong to diverse local communities, should work together closely. Furthermore, as was pointed out at the Conference, applications of Science and Technology to local communities have differed region by region. The strong cooperation of scientists from various regions is necessary for the propagation of the best practices of the different countries of the region among themselves. SCA pledges its full support for this undertaking. SCA will help pursue inter- and trans-disciplinary science undertakings in Asia with the close collaboration of scientists as well as other stakeholders. At the Conference, a discussion on a wide range of issues in diverse scientific fields from nanotechnology to science communication highlighted the importance of the need for the application of the latest advances in the different areas of Science and Technology for the development of the countries of the region. In order to utilise fully the potential of Science and Technology, the integration of knowledge in science into the political agenda through the involvement of non-scientific stakeholders, especially policymakers, is indispensable and SCA will put every effort in trying to make this a reality. SCA will strengthen collaboration with internationally important initiatives, such as Future Earth. A session which discussed recent developments in Future Earth emphasised the importance of Asia’s contribution to this international undertaking. As Asia’s responsibility for the pursuit of global sustainable development remains important, scientists in the region must further join forces to contribute to the utilisation of advances in Science and Technology to assure a sustainable future for Asia. SCA will further deepen its involvement in national and international undertakings to address climate change issues. 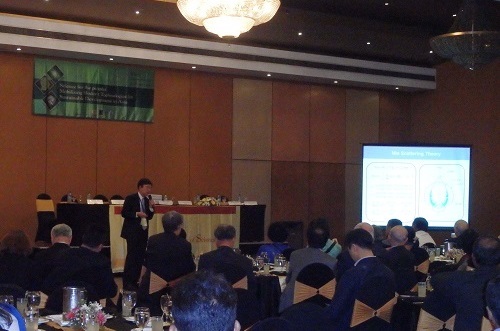 The SCA Conference draws attention to the various issues faced by countries in Asia from climate change. SCA welcomes the successful conclusion of Paris COP 21 negotiations on climate change and resolves to encourage its members and the countries of Asia to adopt policies which can help alleviate the effects of climate change. SCA will advance policies that will help in nurturing and promoting young scientists and women scientists in the region. A welcome feature of this Conference was the participation of a large number of young scientists and women scientists from Asia in the Conference. Separate sessions organised by young scientists and on gender issues in science were noteworthy. In order to ensure Asia’s sustainable development in the future, the nurturing of young scientists and the promotion of the involvement of women scientists in the region should be of the highest priority. On 31 May, Hon. Ranil Wickremasinghe, Prime Minister and Hon. Susil Premajayantha, Minister for Science, Technology and Research participated in the meeting. Prime Minister Wickremasinghe put forward a formulation of the Ten-Year Plan, which was designed to an advancement of Sri Lanka’s scientific and technological development, mentioning that the Sri Lanka’s development laid in the areas of technology and innovation, and establishment of cooperative relationship with China, Korea and Japan.